Early this morning, Apple unveiled the 2015 edition of their annual Best of App Store lists – a collection of the best apps and games released on the App Store over the past 12 months. This year, in addition to iPhone, iPad, and Mac apps, Apple has added editorial picks for the newly launched watchOS and tvOS platforms, highlighting the best apps and games released by third-party developers on Apple Watch and Apple TV. We debated. We argued. Everyone had favorites, but to make this list of 2015's finest, there could be no doubts. What you see here made the cut—they're the most visionary, inventive, and irresistible apps and games of the year. After you've browsed our selections, don't miss the titles that topped the charts in 2015. In this year's Best of App Store, Apple has picked Periscope, The Robot Factory, Affinity Photo, HBO Now, and Dark Sky as apps of the year on its five developer platforms. On iOS, Apple also features special mentions for most innovative apps (Workflow on the iPhone), best app on the iPad Pro (uMake), and best app on the iPhone 6s (Instagram). On Apple TV and Apple Watch – the most recent additions to the App Store ecosystem – Apple hasn't picked any runner-ups, but instead they're simply showcasing the best apps and games. The iOS section includes apps that dominated the top charts as well, with Minecraft, Trivia Crack, Messenger, and Snapchat unsurprisingly in there. Overall, Apple's picks offer a good mix of big budget titles and smaller, indie studios such as DeskConnect, Readdle, or The Soulmen. 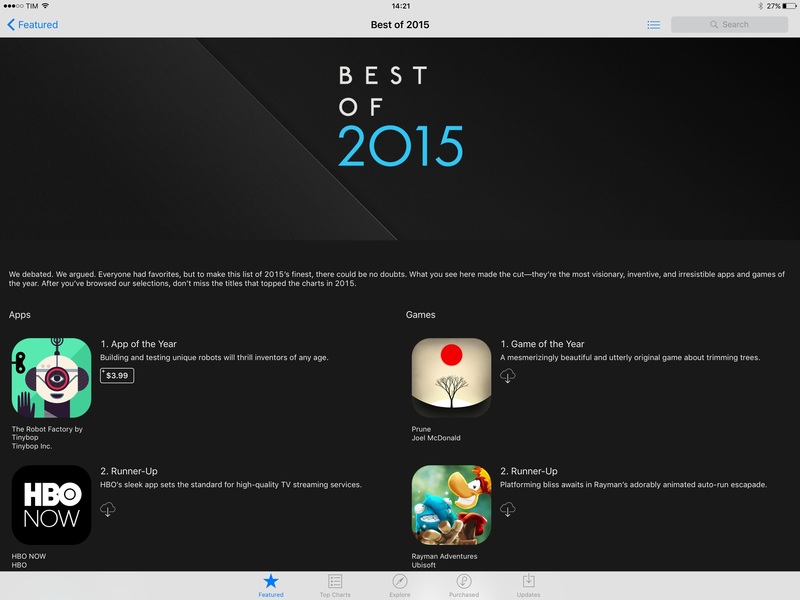 You can find Apple's complete Best of 2015 on the front page of each App Store today; a recap of all the winners and runner-ups (from the US App Store) is available below.